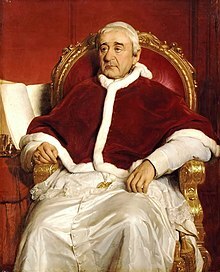 Pape Gregory XVI (Laitin: Gregorius XVI; 18 September 1765 – 1 Juin 1846), born Bartolomeo Alberto Cappellari EC, reigned frae 2 Februar 1831 tae his daith in 1846. ↑ John-Peter Pham, Heirs of the Fisherman, (Oxford University Press, 2004), 187. This page wis last eeditit on 6 Juin 2018, at 06:26.